Answer and transfer telephone calls or take messages. Schedule appointments and receive customers or visitors. Type, format, or edit letters or reports. Scan document and do submission. Copy, file, and update paper and electronic documents. Prepare and process bills and other office documents. Collect information and perform data entry. Other general task assigned by executives. 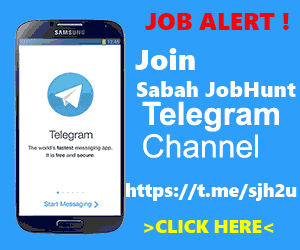 Candidate must possess at least a SPM, Diploma / STPM or equivalent. Spoken language: English, Malay and Mandarin. Polite, Hardworking, committed to the job and work independently. Hardworking, committed to the job and work independently. Candidate must willing to work at Kolombong area.